Finally, the long-awaited final photos of the gut renovation to my kitchen and the final results of the many months of design decisions and construction . . .Ta da! 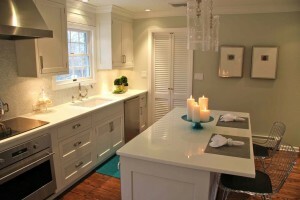 The new kitchen is both open and airy. 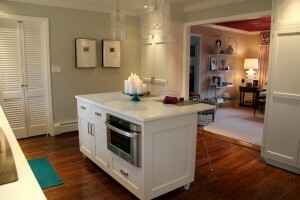 The kitchen table was removed to create an open floor plan between the kitchen and the living room. The colors of the living room are glimpsed through the wide opening between the rooms, and the cool, soothing neutrals of the kitchen provide a contrast to the bold ceiling of the living room. The kitchen is now as functional as it is beautiful. 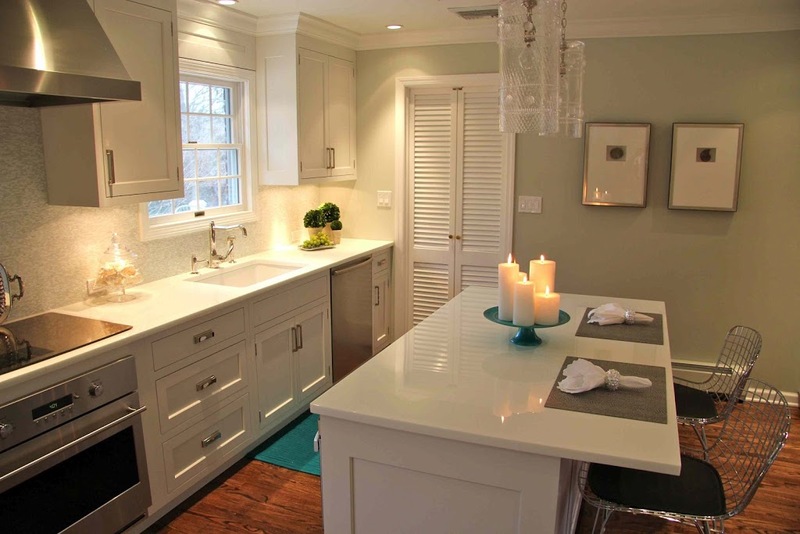 Workspaces abound, and appliances are placed to create a flow that makes it possible for several “cooks to be in the kitchen” at once! 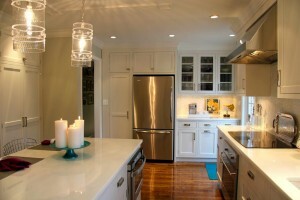 The white glass countertops sparkle, and yet are durable for prep and easy to clean. Cabinets extend to the ceiling, and drawers utilize every square inch of space so that the beautiful countertops needn’t be cluttered with tools. 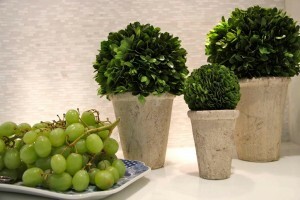 The creation of specific areas for specific tasks in the kitchen is essential. 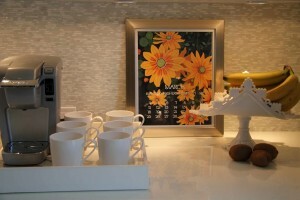 Here a coffee station houses things we use every morning: the coffee maker, mugs, fresh fruit, and my monthly calendar – one of my favorite things! 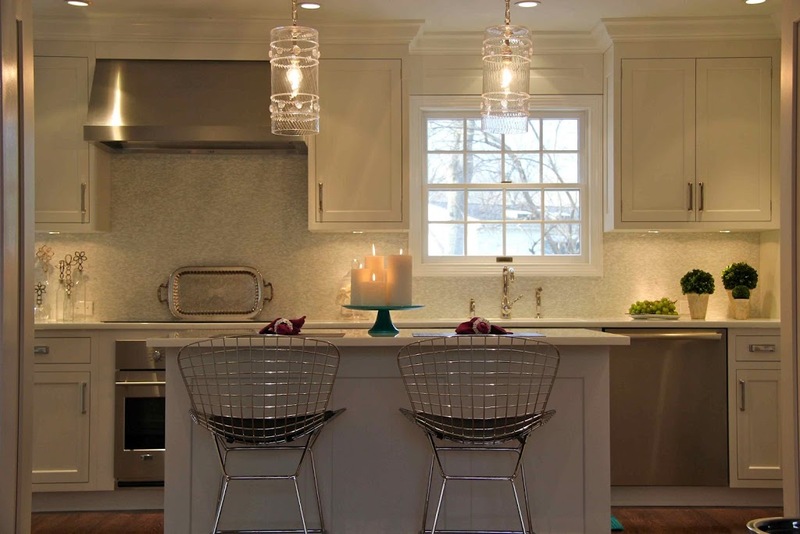 The pendant fixtures above the island cast a warm pattern of light on the ceilings and walls. 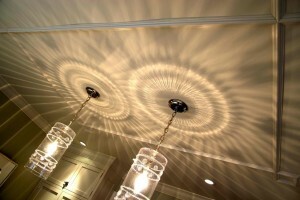 I installed an applied ceiling trim for added interest above the island as a frame for the light fixtures. It subtly repeats the pattern on the window treatments in the adjoining room. 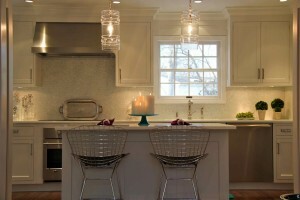 The stainless stools are very modern and make the island into a seating area as well as a preparation station. The island was designed to feel like a piece of furniture. 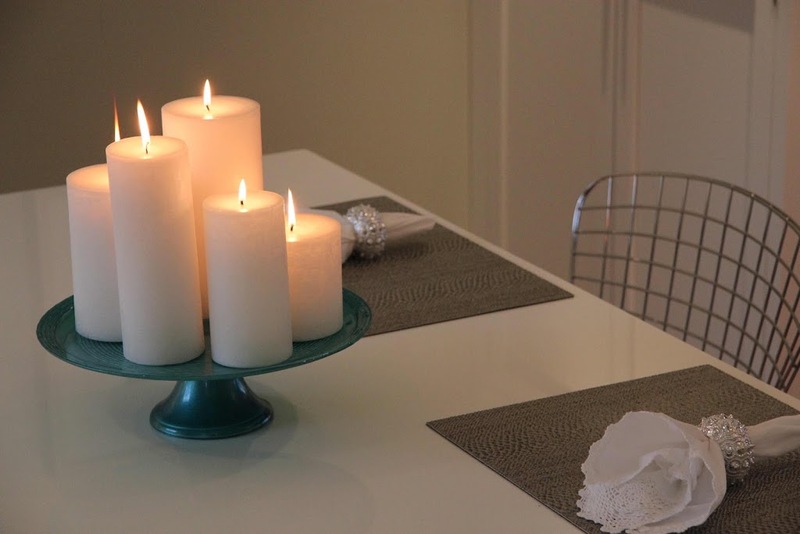 The inclusion of more traditional accessories warms the room and gives it a sense of gravitas – the antique silver tray behind the stove; inviting candles on a cake stand, the lace napkins. A pop of green is visible in the addition of “earth” in the room – here the collection of boxwoods and a platter of fresh green grapes bring some life to the space. 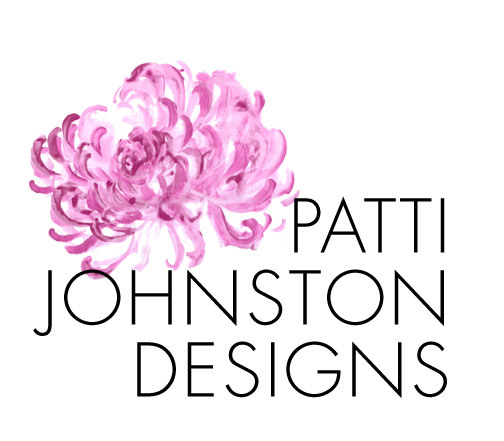 Cooking and entertaining is a pleasure in the new and improved Patti Johnston Designs kitchen! But stay tuned, because the renovation of the kitchen spilled over into my den, and soon I’ll document that transformation as well . . .